By funding raised beds the RHS 'Greening Grey Britain' scheme has backed Let's Eat the Park and has endorsed the principles it is founded upon. The 7 new beds were erected by the LEAP team over this Autumn. 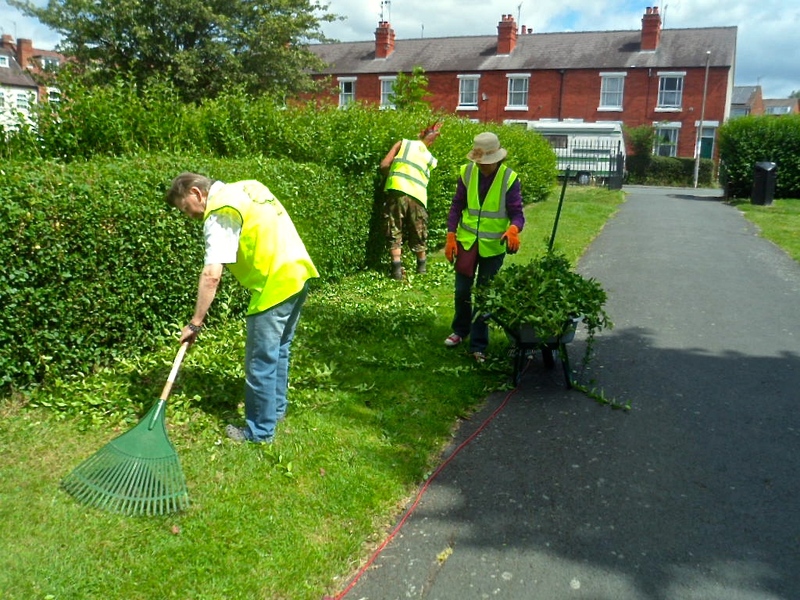 Above are a few pictures from their creation and the distribution of wood chippings supplied to us by Wyre Forest District Council. 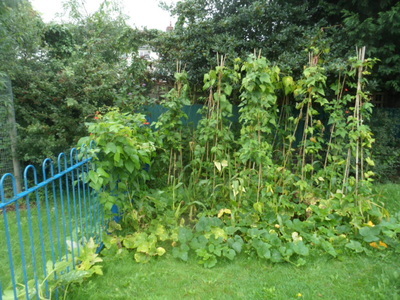 These beds have greatly increased food growing potential in the park and represent the stamp of approval for LEAP from yet another national charity. 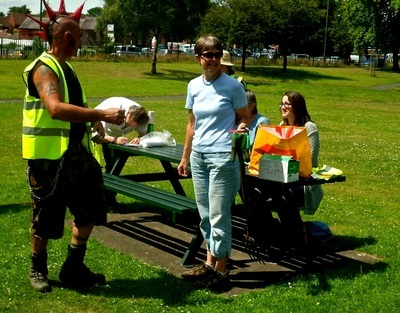 The LEAP team are most grateful for the excellent support the RHS and WFDC Parks managers have given our project contributing to its local success and effectiveness as a free source of nutritional food. LEAP work parties continue more or less weekly, although the initial funding from the People's Health Trust has now ended, the coffers remain well stocked and new bids are presently underway. Having had the funds to kickstart the project back in 2014 we have continued to keep funding topped up and we remain solvent thanks to a variety of funders and supporters who have helped to maintain our independence and autonomy. 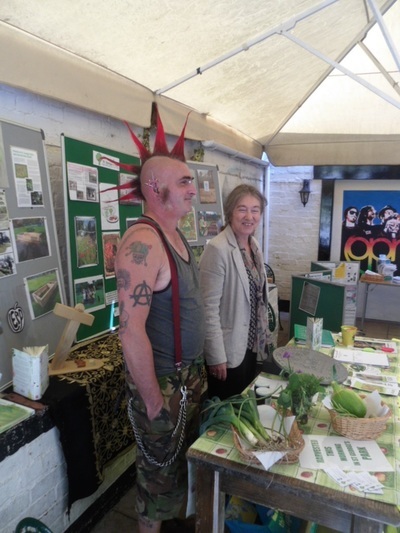 The project has been a runaway success, we have recently had a final payment from the People's Health Trust to help establish pop-up allotments in the Horsefair as well as extend and further develop our park based activities in St George's Park. The Royal Horticultural Society that has already sponsored four raised beds in the park has pledged further funds for three more new raised beds we will be installing this Autumn. 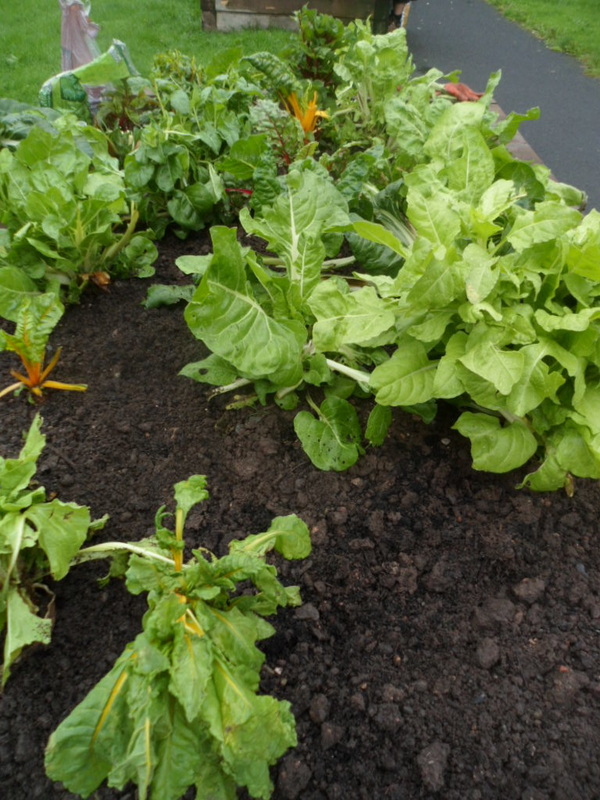 Here are a few pictures from today's work party showing some of the produce which is being regularly harvested by members of the local community as we address food poverty in the area. 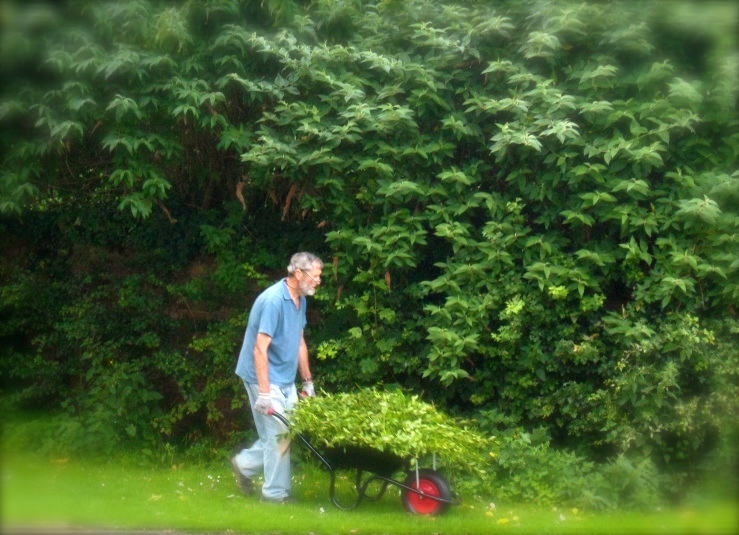 Here are a few images of LEAP work parties in action in St George's Park and the produce we have grown this Summer. 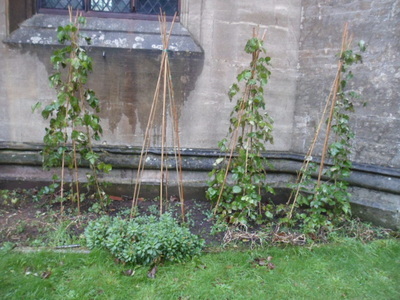 St George's Park, the churchyard of St George's Church and the planters at the Old Peacock pub in the Horsefair are all sites where free LEAP edibles can be harvested. Let's Eat the Park - LEAP work parties are making a difference addressing food poverty, social isolation and outdoor activity in our little urban green spaces near Kidderminster town centre. 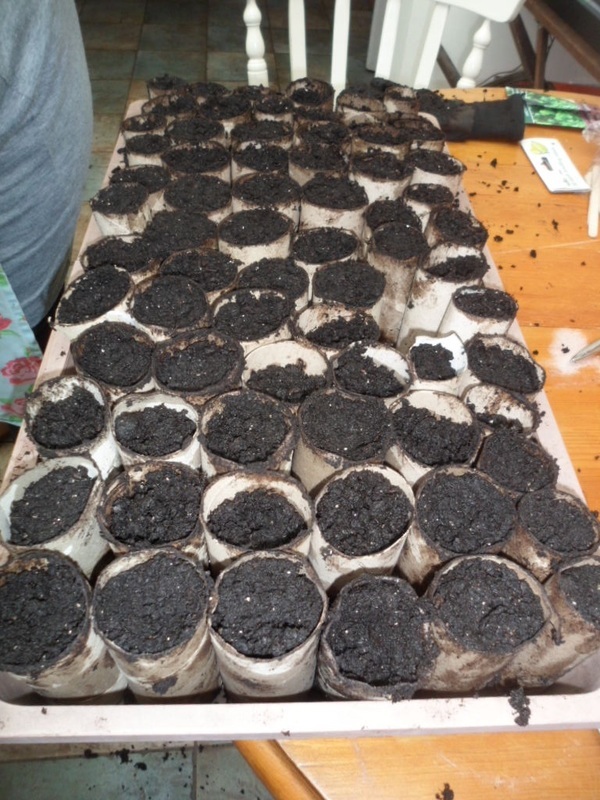 The LEAP team have been sowing seeds today in Nicky's kitchen as we did around this sort of time last year. This year Teamsters Nicky and Carol had a productive day getting the LEAP vegetable growing off to a good start. Using recycled toilet roll centres to start some of the crop they sowed a variety of food to share in Horsefair's parks and green spaces. Both Boltardy beetroot and rainbow chard were planted in this way. 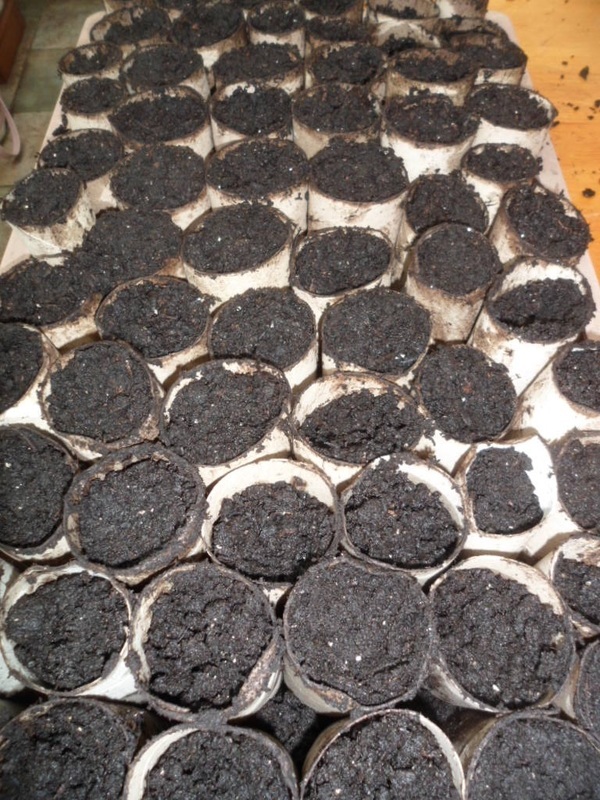 Below there is a sample of the varieties we have sowed and some of the reasons they were chosen. On almost every level surface in Nicky's conservatory there are seed trays containing a cornucopia of edible delights including Musselburgh Leeks and Borecole a form of Kale. Borecole tolerates cold better than most brassicas and is less vulnerable to birds and doesn't get clubroot or cabbage root fly. We are planing this to extend the harvest well into the winter months and may provide a healthy and tasty addition to Christmas dinners. Because we don't use any chemicals in St George's Park or any LEAP site we have sown 'Flyaway' carrots this year to beat that enemy of the carrot grower - carrot fly. This hardy British bred hybrid is resistant to this destructive pest and makes a perfect companion to the leeks sown this afternoon. Carrots are rich in vitamin A, Vitamin C, Vitamin K, vitamin B8, pantothenic acid, folate, potassium, iron, copper, and manganese. In Nicky's heated propagators there are three tomato varieties (Alicante, Tumbling Tom and Black Russian) and Jalapeno chilli peppers. 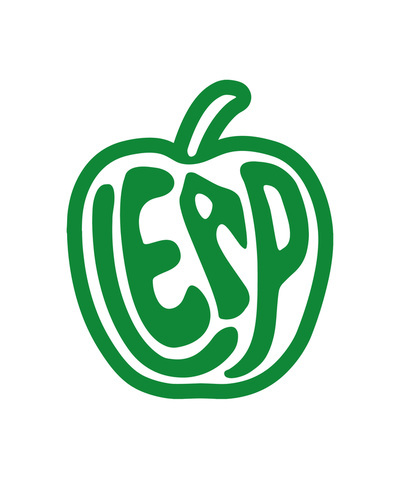 Like other peppers, jalapenos are rich in vitamin C, an antioxidant that helps prevent damage from free radicals, rogue molecules that can cause cell damage in your body. Jalapenos also contain a good dose of vitamin A, which supports skin and eye health; one pepper gives us around 17 percent of the recommended daily intake for men and 22 percent for women. Jalapenos are an excellent source of the B-vitamin complex, such as folate or folic acid. The hotness of Jalapenos is due to a natural plant compound called capsaicin. Capsaicin has a wide variety of health benefits. 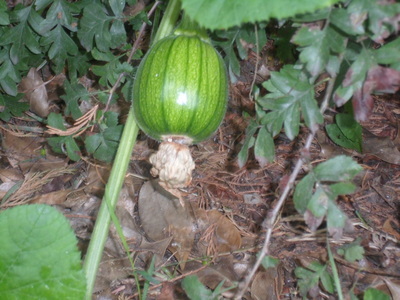 It is for example an anti-inflammatory and is also good for our circulation. All these benefits and next to no calories too, Jalapenos spice up our meals and help our bodies fight disease. Chillies will again this year (all being well) be available to share in the raised beds as they were last year and in other LEAP sites, look out for more info about this on the website. ​Although LEAP is in the final semester of its original People's Health Trust funding, the sowing and planting plan for this year works to a different, more natural timetable. Sustainability is about organising on a generational scale, our trees for example will produce fruit increasingly as time goes on. We have all we need in the shape of local resources, although more volunteers are always very welcome and adequate funds, which are not massive but are sufficient to keep LEAP moving forward with new partnerships and ever deeper community sector collaborations. We're looking forward to developing our new projects for 2016/17 - eating our increasingly edible environment and sharing it with you. All are welcome to join us. 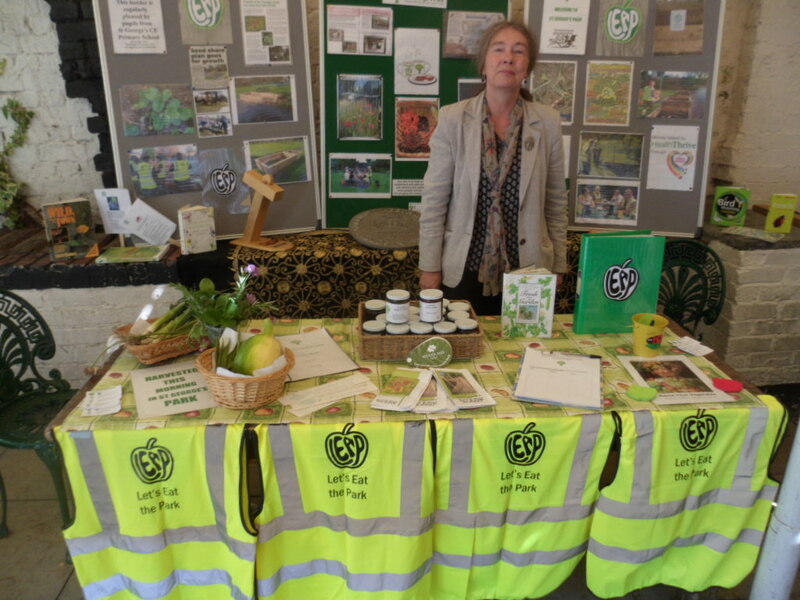 LEAP stall at Greener Living Event a Great Success! 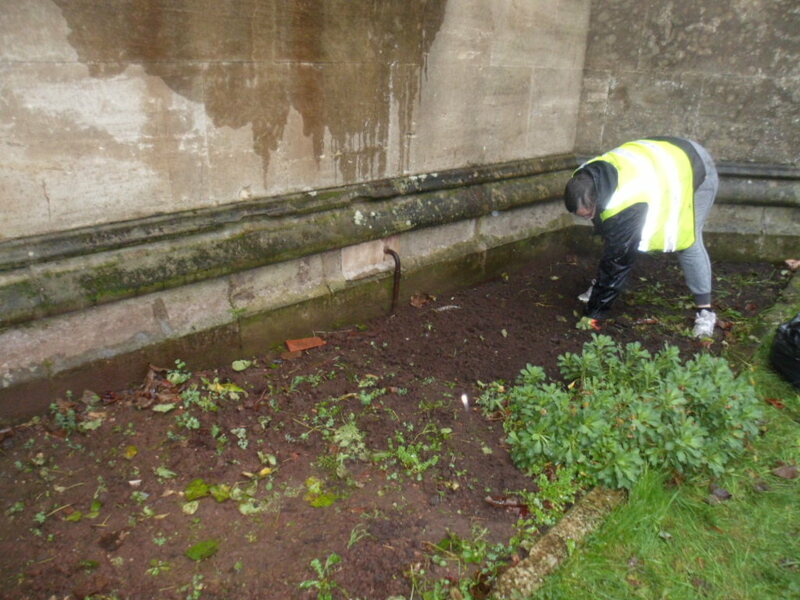 ​The LEAP team have formed volunteer work parties sometimes in more than one location, pretty well every Saturday since June 2014, sometimes with other days during the week too. The size of work parties vary and different people are involved at different times but with a core of around 8-10 ‘regulars’ including committee members of FoSGP and the LEAP Project. 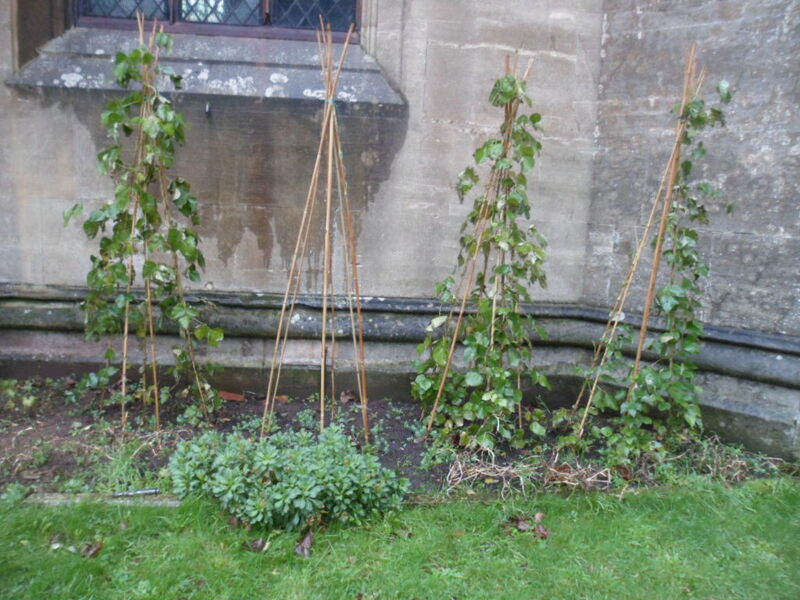 This weekend the team dismantled the bean wigwams in the churchyard ready for winter works. The LEAP team and its parent organisation the Friends of St George's Park are a community group with no meeting place or home of our own except the park. 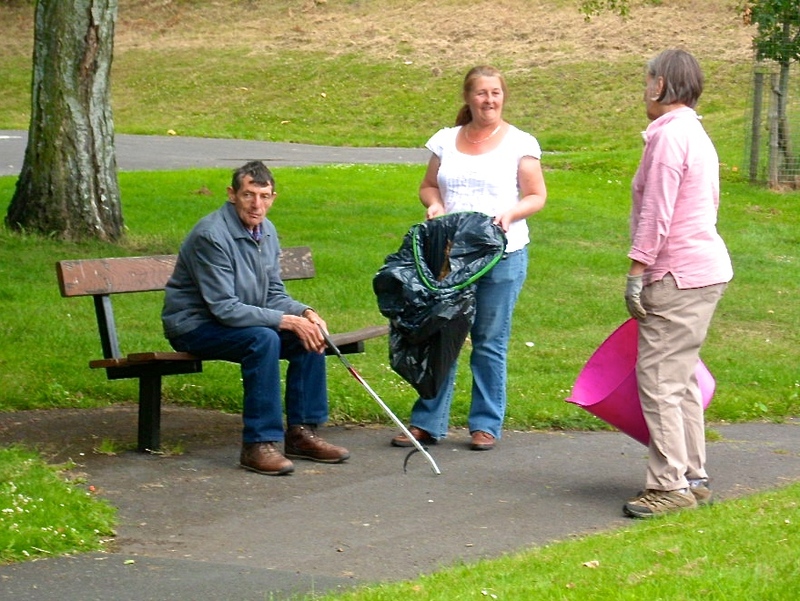 The absence of community hubs in the area means that much of our organising takes place in the open air - come rain or shine. 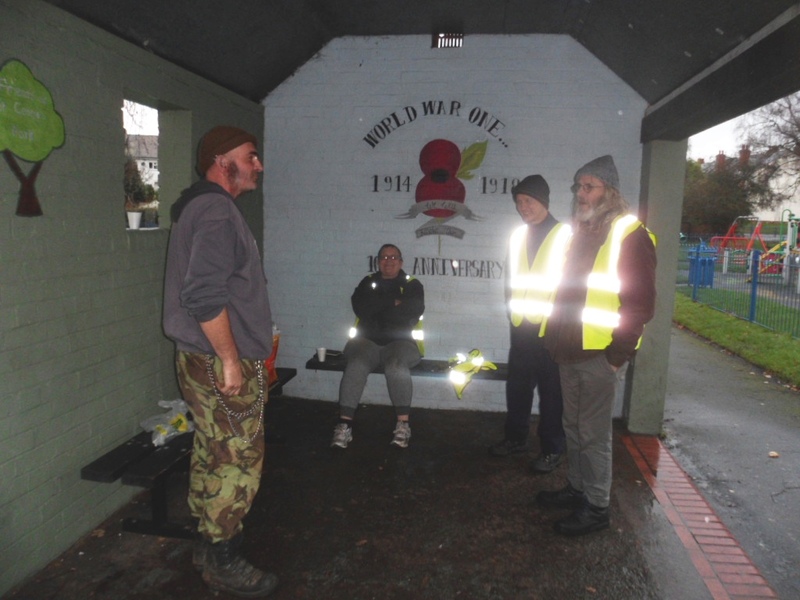 We are very grateful to Kidderminster & District Youth Trust for giving us space to meet ten times per year at the Youth House in Kidderminster town centre, but were it not for their kindness the Project would be homeless. It is one of the stated aims of the Let's Eat the Park Mission Statement to work toward the establishment of a community hub, but there has been no movement on that issue since the Friends group first put it on the agenda for local discussion four years ago. 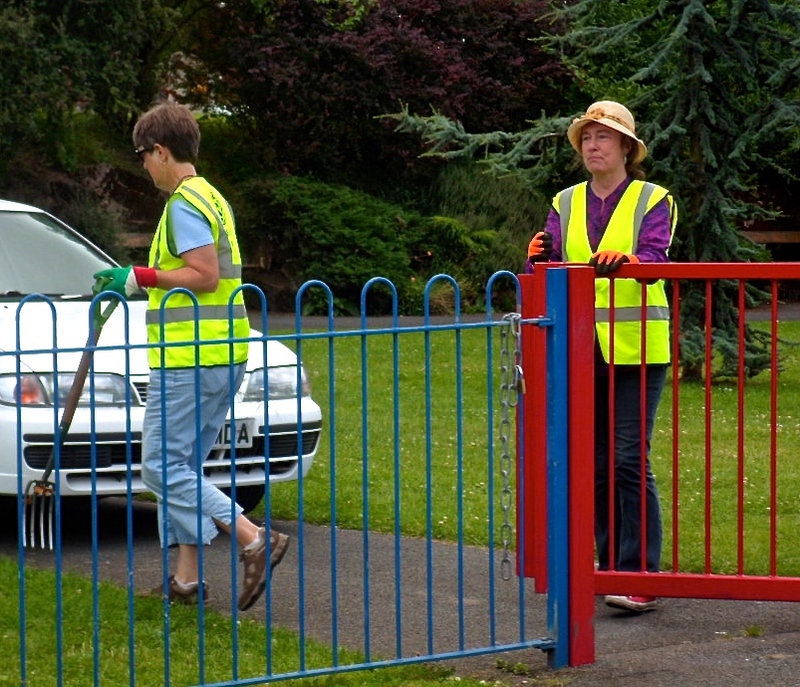 We often visit other local authority areas in neighbouring localities and are invariably surprised by the resources available to community groups in those areas by comparison with our own experience. ​However, the lack of a physical base has never held the LEAP team back. On the contrary we use the park for our base and the shelter as the only cover we've got from the elements.This week is was wet and cold but the team separated into two groups loading swept-up leaves into the new raised bed in St George's Park, doing a litter pick in the park and working in the churchyard bays, we got quite a lot done despite the weather. A lot of discussion and planning takes place at the work party refreshment breaks which any park user, elected member, council officer, safety team member or interested party can attend and take part in. 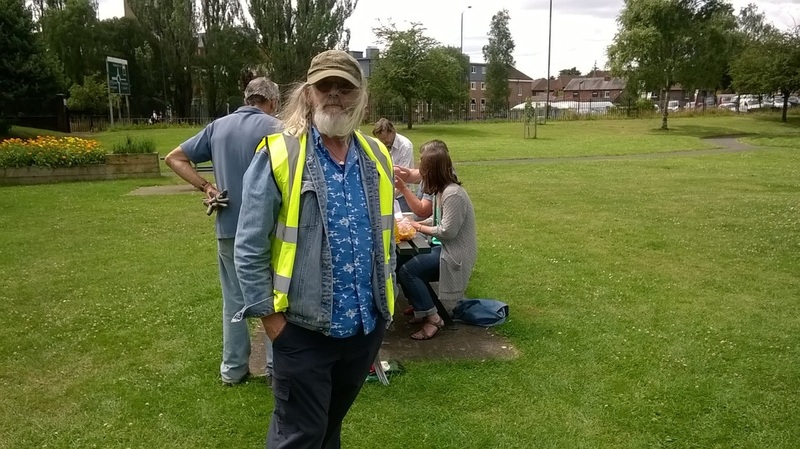 The LEAP project is of course characterised by the provision of free food in the parks and other local green spaces, the free refreshments are part of this ostensibly moneyless economy of commitment to community gardening. It is ostensibly moneyless because there are no financial costs to people benefitting from the project, open to all irrespective of personal circumstances, but of course fundraising is required to sustain the project over time. 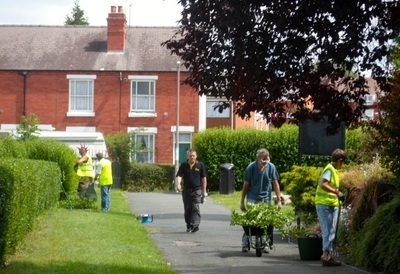 The benefits of being involved in projects like LEAP are probably unquantifiable but health economics demonstrates the significant financial value of exercise, improved diet, outdoor activity, volunteering, green spaces, parks and gardening by enhancing health and wellbeing and LEAP ticks all the boxes. Green Tomato - Red Tomato the Final Call! Well it's half way through October and we picked what will probably be the second to last tomato crop from St George's Park at yesterday's LEAP work party. From what other people have told us we know we are far from alone in not seeing many of our tomatoes ripen this year. Like other growers we are left with a lot of green tomatoes that have actually outnumbered red ones in LEAP beds by a ratio of at least twenty to one. 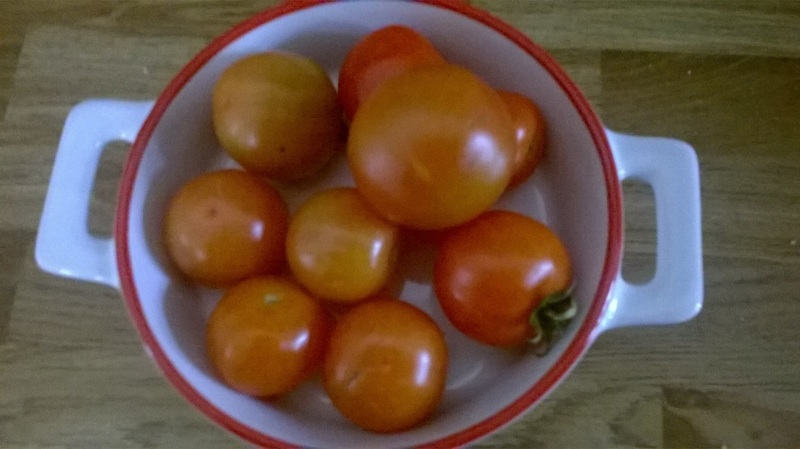 Tomatoes may ripen on the window ledge or in a dark dry place, but after looking into their wonderful properties below you may decide not to bother waiting for them to turn red. There are many other delicious ways of eating green tomatoes, most famously fried in breadcrumbs as they are in the southern states of the USA. 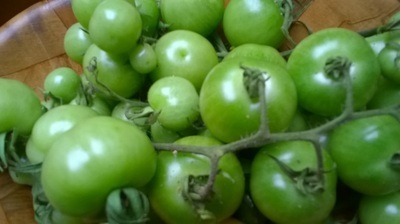 There are many recipes on the internet of great ways to prepare green tomatoes. These FREE foods are still available in St George's Park on the railings on the play area side of the paddling pool enclosure - easily harvested from the path. Here are some fascinating facts about green tomatoes from extracts taken from the Healthy Eating page of San Francisco based website SFGate. Green Tomatoes even more than red ones are superfoods. "A large green tomato has 43 milligrams of vitamin C, providing half the daily requirement for men and nearly 60 percent for women. It also has 58 micrograms of vitamin A, giving you close to one-tenth of your recommended daily intake. Getting enough of these antioxidant vitamins can help protect your immune system and prevent premature aging. Vitamin C also helps your body absorb iron, so it is beneficial to eat green tomatoes with an iron source, such as meat, poultry, fish, spinach or an iron supplement. According to research Tomato plants use their tomatine content to combat bacteria, fungi, viruses and insects, but tomatine also appears to offer many human health benefits. One large green tomato provides about 10 percent of your daily requirement for the B vitamins thiamin, vitamin B-6 and pantothenic acid, as well as a little less than 10 percent of the riboflavin and niacin you need each day. A green tomato also has one-fifth of your recommended daily intake for vitamin K, a nutrient that further benefits your blood by helping it to clot properly. Although a green tomato is low in mineral content, it supplements your diet with 5 to 10 percent of your recommended daily intake for iron, magnesium, phosphorus, potassium and manganese, minerals that benefit your blood, nerve function, bones and muscles. It also provides 2 grams of protein and 2 grams of fibre, helping to satisfy your appetite and keep you feeling full. For only 42 calories, a green tomato supplies a wide range of nutrients." The Friends stall at the free Green Fair was a great success as indeed was the whole event which included Friends of the Earth, Worcestershire Wildlife Trust, Forest Dog Rescue, Bishop's Wood Swan Rescue, Dr Hadwen Trust (for humane medical research) Wyre Forest Veggies and Vegans, Wyre Forest Green Party with delicious vegan Mexican fare provided by Mex It Up. The Fair was a great tribute to its organiser Ronnie Lee, whose hard work made the day an event that all contributors said they want to see repeated again next year. Special thanks go to Sid and Sand at the Boars Head for providing the venue and making us all feel welcome. We met lots of wonderful people who visited our stall and who took an interest in Let's Eat the Park and other FoSGP projects. Around 40 suggestions were made for edibles people want to see grown in LEAP project locations around Horsefair. 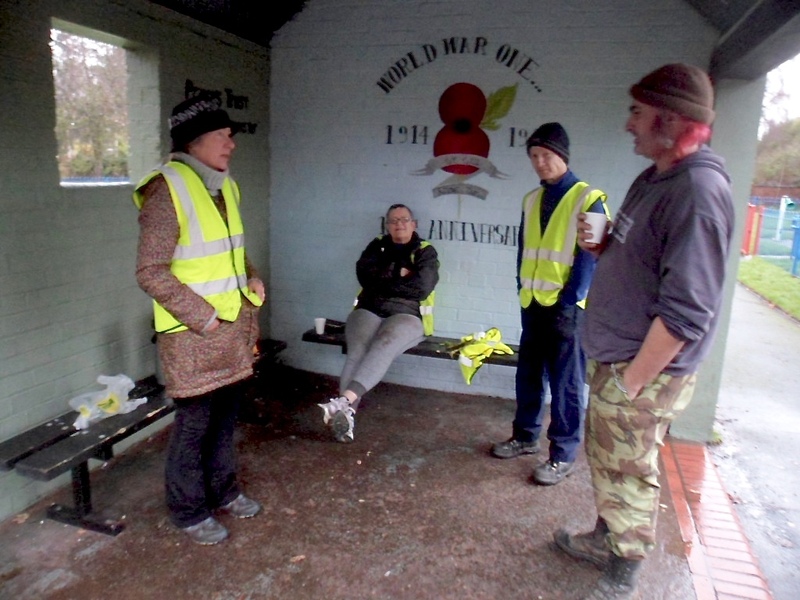 Information and contact details were exchanged with a number of individuals, groups and activists making it an important local networking event where new alliances were formed. The Green Fair provided a great opportunity to share our enthusiasm for LEAP and show off some of its produce including Nicky's fabulous hedgerow chutney and damson jelly - made from park ingredients - plus the various vegetables, herbs and almonds harvested from St George's Park on our way to the event. 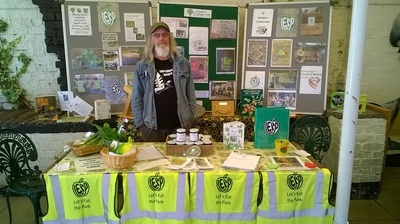 Let's Eat the Park is now a well established local initiative in Kidderminster and beyond in the wider Wyre Forest district, linked-up with the most active and influential environmental groups in the area and many free food enthusiasts from far and wide. Thanks to everyone who visited our stall and took an interest in what we do, especially the ones who provided contact details, we'll be in touch soon to keep you updated with developments as they unfold. Images from our LEAP work party in St George's Park today. 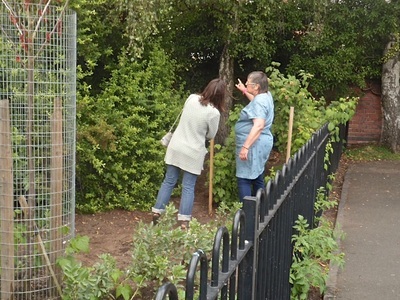 The inner hedge was cut along the path side - vegetable beds weeded, more onions and courgettes picked and given away to work party members and passers-by. More information on the LEAP blog coming soon.